Granite Challenge-Back By Popular Demand! 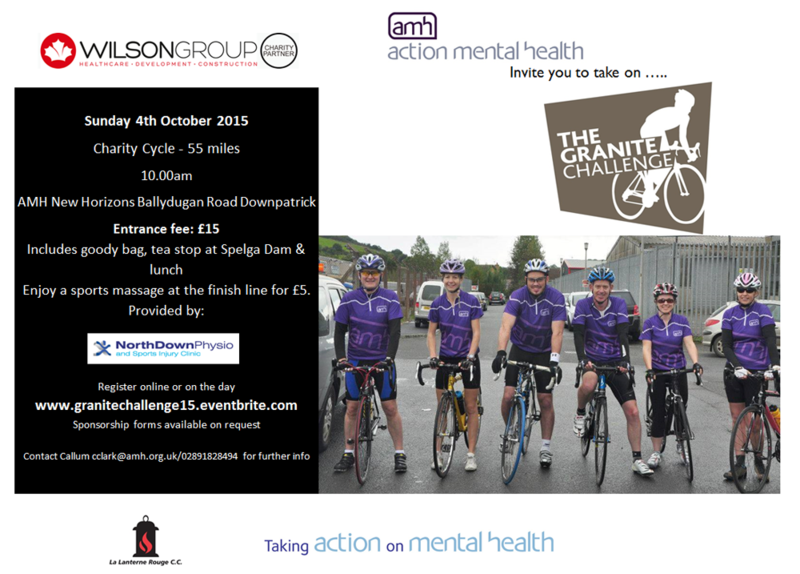 The 55 mile Granite Challenge starts in the Cathedral town of Downpatrick, cycling via Tyrella towards Dundrum, then along the coast road through the seaside town of Newcastle, towards Annalong. Then its up into the Mourne Mountains, past Silent Valley. The climb up to Spelga will be rewarded at the top with tea and traybakes. Then it’s downhill towards home, through Bryansford, Maghera and Clough. Final destination Downpatrick, where a homemade lunch awaits you. Entrance fee: £15 includes goody bag, tea stop at Spelga Dam & lunchRegister online www.granitechallenge15.eventbrite.com or on the day from 9am! Enjoy a sports massage at the finish line for £5.00 with all proceeds going to AMH. Kindly provided by: North Down Physio and Sports Injury Clinic.